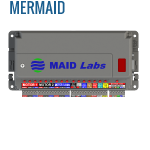 FlowMaid is a small open channel flow meter used to record level, volume and discrete events. Data is downloaded to a USB key or MaidMaps. No software required to produce reports. MaidMaps can activate a remote relay and display readings. PressureMaid is a small pressure monitoring and datalogging device. This is the simplest way of monitoring remotely pressure in real time. It generates warnings and alarms via emails with the MaidMaps software. Data is downloaded to a USB key or MaidMaps. No software required to produce reports. MaidMaps can activate a remote relay and display readings. 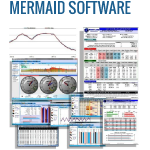 MaidMaps is a web page showing data from all the instruments, except Mermaid. When a value becomes abnormal, a sound and an email is generated. The operator can remotely open or close a valve or operate a motor. MaidMaps generates charts and records exportable to Excel. © 2016 Copyright Maid Labs.